From John Evans (BusPreservation) collection we have this great shot of a line up at Milehouse Depot. This doe shave a look at 'Death Row' about it. No date known. Members of the PCTPG would kill to have access to a collection of buses like this! Wonder why they all seem to have the front upper deck window missing? It's quite a sad sight actually. 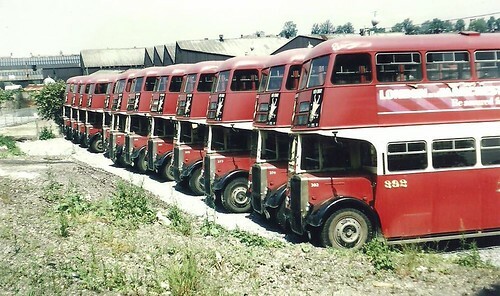 we already have a fleet of 14 buses at the moment! I may be wrong but based on the bus nearest to the camera it appears that these are sisters of 358 'Sir Francis Drake'. I also won't be surprised if 358 was in the actual pic somewhere! The bus nearest the camera is 392 (HJY292) an all Leyland PD2 with the classic Leyland Faringdon style bodywork. Unless my eyes deceive me all the vehicles in the lineup are identical. 358 (originally 58)is not a sister of 392 having the later and imo less pleasing to the eye Metro Cammell bodywork. Sorry Rob!